Carnegie Mellon University’s campus offers opportunities for events such as receptions, social events and dinners in unique settings. 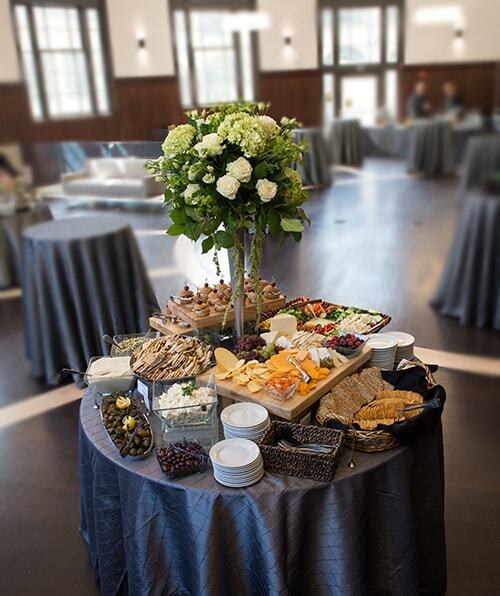 The Singleton Room, located in Roberts Hall is an adaptable space for any event with a scenic view of Oakland and the University of Pittsburgh’s Cathedral of Learning. Located next to the Tepper School of Business, is the Posner Center, which houses rare and historic books and art collected by Mr. & Mrs. Henry Posner Sr. This collection offers a distinctive event space for your next board meeting, reception, workshop or similar event. The College of Fine Arts offers exceptional event space to include the following: the Great Hall, Alumni Concert Hall and Kresge Theatre. The College of Fine Arts (CFA) building was built in 1916 by Henry Hornbostel, who was the original architect of many buildings on campus. It was tradition of Hornbostel to include the buildings he loved in the buildings he designed. In the very center of the ceiling in the Great Hall is St. Peter's Basilica of Rome, part of the Vatican. He also inlayed the floor plan of St. Peter's Basilica in the green marble on the floor. These artistic and historic touches create a unique setting for your next special event. The Regina Miller Gouger Gallery, also within the College of Fine Arts, is a three-floor, 6000-square-foot exhibition space introducing internationally significant contemporary artists to the public year-round. Although availability is limited, due to ongoing exhibits and displays throughout the year, the gallery offers an eclectic alternative to traditional event space.